Petar II Petrović-Njegoš (Serbian Cyrillic: Петар II Петровић-Његош) was a Serbian Orthodox Prince-Bishop (Serbian: Владика, Vladika) of Montenegro and a ruler who transformed Montenegro from a theocracy into a secular state. However, he is most famous as a poet and is considered by many to be among the greatest poets of the Serbian language and a national poet of Montenegro . The first notable writer from Montenegro, his notable works include The Mountain Wreath ( ), the Light of Microcosm (Луча микрокозма or Luča mikrokozma), the Serbian Mirror (Огледало српско or Ogledalo srpsko), and False Tsar Stephen the Little (Лажни цар Шћепан Мали or Lažni car Šćepan Mali). Radivoje "Rade" Tomov Petrović was born on 13 November (1 November Old Style), 1813 in the village of Njeguši, the capital of the Montenegrin district Katunska Nahija as the son of Tomo Markov Petrović and Ivana Proroković Petrović. He had two brothers, Pero and Jovan, as well as two sisters. His family was the House of Petrović-Njegoš - a dynasty that served as the Prince-Bishops of Montenegro for over a century. At the time of his birth, Montenegro did not exist as a modern state. The borders of its territory were undefined and Montenegro was not recognized as independent from the Ottoman Empire, while its de jure ruler was a Venetian -imposed Governor. Power actually lay with the squabbling, disunited clan chiefs, who variously recognised the authority of the Austrian Empire , the Republic of Venice , the Ottoman Empire or the Cetinje Metropolitan (Prince-Bishop). Njegoš spent his early years in Njeguši. In 1825, when his uncle Prince-Bishop Peter I sent him to the monastery of Cetinje as his successor to be tutored by a monk, Misail Cvetković and the Prince-Bishop's secretary, Jakoov Cek. He wrote his first poems there, which he used to entertain the local chiefs and monks. The most famous of them were satirical. In the middle of the year, Radivoje was dispatched to the Topla monastery near Herceg Novi , where he was taught Italian, mathematics, ecclesiastical singing, the Psalter and another subject at the monastery's hieromonk, Josip Tropović. He often attended the ecclesiastical services in the nearby Savina monastery, dedicated to Saint Sava. He remained in Tople until the end of 1826, when he returned to Montenegro 's capital, Cetinje . On 20 January 1827, Prince-Bishop Petar I nominated Radivoje as his successor instead of Đorđije Savov, who went to the Russian Empire and became a cavalry officer. Petar wanted to dispatch Njegoš to Russia, but he lacked the much-needed finances, so he decided to educate Rade himself. He taught him Italian, Russian and German, as well as the basics of English and French. Petar also gave Rade access to his rich library. The Prince-Bishop assigned one of the greatest Serb writers of the time, Sima Milutinović Sarajlija (of Sarajevo , Bosnia and Herzegovina , then part of the Ottoman Empire) to be Radivoje's new teacher. He was taught the Classics, art, history, philosophy and literature. In 1829, Rade gave Sima numerous national poems he collected. The most famous was the song of the National Spirit about the war between the Russian Empress Catherine II and the Ottoman Sultan. I make and pronounce my nephew Rade Tomov Perović my heir, governor and guardian of everything mine and Church's, who I hope shall be a man of work and wisdom, as much as blessed Heavenly Father wished to grant him with, and whom to God, our Emperor and to Montenegrins and Highlanders I recommend with all my heart and soul. It seems to me I have cried all I could. Only because I realised that of crying there is no use, but only damage and peril to my eyes, but still my dolorous heart does not let my stop the tears I am shedding for my father and benefactor. Firstly, because I lost the benefactor's gracefulness, secondly, because the people have lost its pastor and defender who was an unshaken bastion of Christian faith and freedom, and a loyal fatherland's defender and a hesitant ally to the Russian throne up to his last words, which he spoke to me on his death bed. I asked him: "Lord, I see you are dying, but what shall I do now?" And he sat up on his bedding, and began talking to me: "I can not help you with anything now, but hear these last words from me: pray to God and stick to Russia ." Prince-Bishop Radivoje took over the leadership over the Serb clans of four districts: Katunska Nahija, Lješanska Nahija, Riječka Nahija, and Crmnica, as well as four Highland tribes: Bjelopavlići, Piperi, Rovčani, and Moračani. He was only the ecclesiastical ruler over Boka and the Skadar . He was still young, so his father Tomo and his uncle Captain Lazar Proroković assisted him as well as some major Chiefs. At the end of 1830 and beginning of 1831, Governor Vukolaj Radonjić moved against Radivoje wishing to end the House of Njegoš's dominance over Montenegro. At the National Assembly held on 17 November 1831, Vukolaj Radonjić was deposed from his office as the Governor of Montenegro and replaced by Sima Milutinović, Rade's old teacher. On 31 January 1831 on the island of Kom in the Monastery of Vranjina, the Archbishop of Rascia-Prizren declared him as the official Archimandrite. Radivoj received the name Petar II in his predecessor's honour. Prince-Bishop Petar II invited two Serbian envoys in the Russian Empire to come and assist him in his reign: Mateja Vučićević, Montenegro's viceroy in Russia and his uncle, Ivan Vukotić, a subofficer in the Russian Army. ...imam čest Vama objaviti kako se Crnogorci nahode u soglasiju među sobom isti kako su bili ovoga prošloga vremena od kako je blaženopočivšeg mitropolita zavješčanije proglašeno, ali sada je suviše stavljeno upravlenije narodnje, koje upravlenije sostovlja 180 ljudih, iz kojijeh su 16 sovjetnici (senatori), a 164 ispolnitelji (polizia), koje sluša narod dobro i kako je dužnost narodnja svoje starije slušati i sobom odabranima povinovat se. Mene se raduje srdce i duša kada ja viđu moje otečestvo tako složno i kada viđu toliko njihovo počitanije k našemu carju i blagodjetelju i k njihovijema starješinama i glavarima, ali kakva će mi jošt i ovo radost biti kada viđu moje otečestvo đe napreduje u naukama i procvjetava prosvješčenijem i kada ga viđu da počne izlezati svoje prosvješčene i vjerne sinove, koji će ga umjeti braniti ne samo oružjem nego i perom umnim. Ivan Vukotić became the first President of the Senate, while Mateja Vučevićević became its first Vice-president. The Senate's seat was in Cetinje , while the Guard's Headquarters were in Rijeka Crnojevića . Petar II was present on every assembly of the Senate except judgments of capital sentences, in which he was forbidden to participate by the canon law. Prince-Bishop Petar II later named captains to monitor the Serb clans in his domain and to act as his representatives to the clans, and he as well also created the Grenadiers (Perjanici) - the Prince-Bishop's personal elite guard. He also formed a special Border Militia ( or Пандури) to patrol the borders of Montenegro . Up to 1832, Petar fully cancelled governorship, therefore affirming full power over Montenegro . Petar II renamed the Praviteljstvo suda into Praviteljstvujušći sovjet, expanding its powers from just courtial to also management. Prince-Bishop Petar II wanted to raise Montenegro's international prestige. In order to achieve that, after a brief stop in Vienna , he visited the Russian Czardom in 1833, where he was accepted into Ecclesiastical service as Prince-Bishop of Montenegro in Saint Petersburg , the Empire 's capital. In 1833, just before his journey to Serbia , Serbian Orthodox Christian Bishop of Užice gifted him Danica of Vuk Stefanović Karadžić from 1826. In 1836, he paid another visit to the Russian Empire , again making a short stop in Vienna . 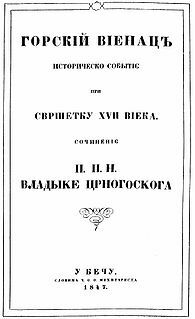 The same year, 1836, he published The ABC of the Serbian language. In 1838 he also published The Serbian Grammar. He also re-printed the school textbooks originally printed by his uncle Petar I Petrović-Njegoš The Serbian elementary reading book. The conflicts with the neighbouring Muslims of the Ottoman Empire were insignificant - except the epic struggle with Smail-aga Čengić in 1840 on Mljetičko. Peter could not achieve the high statehood of his predecessor - the Serbian Orthodox Christian monasteries of and Stanjevići were bought by the Empire of Austria , while Vranjina and Lesandro were seized by the Pasha of Skadar . Although Peter II always supported rebels against the Ottoman authority and gladly went to openly fight the Ottomans, Russia's peaceful policy towards the Ottoman Empire meant that no larger martial success could be undertaken. In 1842, Prince-Bishop Peter II constructed another elementary school - in Dobrsko Selo. On the 11 June 1842, the Prince of Serbia Mihailo Obrenović and the Serbian Literature Society elected him as an "Honorable Member" as a reward for his merits in literature and education of the Serbian people. Later, in 1845, he was declared the Metropolitan of Cetinje . The same year, 1845, Peter II published the Light of Microcosm, an impressive, masterfully written philosophical work. In 1846, Peter wrote a collection of Montenegrin national poems - the Serbian mirror in honor of one of the greatest Russian writers - Pushkin. Serbdom has to unite first. I will, then, to my Patriarchate of Peć and Serbian Prince to Prizren. Spiritual authority to me and secular to him, over the nation free and united. In late 1848 and early 1849, Prince-Bishop Peter II assisted the Revolutionary fights of Croatian Ban Josip Jelačić and maintained close ties with the Principality of Serbia. Although Peter II's outer policy completely relied on Russia, Russia maintained good relations with the Ottoman Empire - so nothing more than a reconciliation with the Ottomans could be achieved. In 1851, Prince-Bishop Petar II minted a Montenegrin currency: Perun. Petar named it by the supreme Slavic mythic god. In 1851, Peter II caught tuberculosis. He paid a visit to the Italy the same year, 1851, attempting to find a cure. The same year, 1851, he managed to publish his last major work - Of false Tsar Stephen the Little. Peter II Njegoš died in Cetinje of tuberculosis on 31 October (October 19 Old Style) 1851 - exactly 21 year after his accession to the throne; he was buried in a small chapel on top of Mount Lovćen where his mausoleum was built. During the period of Communist rule in Yugoslavia it was demolished for ideological reasons by the authorities to make way for a secular monument.